Free crafts, craft projects and patterns. Don’t throw your old toothbrushes away – use them to make homemade speckled Easter eggs with your choice of paints, dyes and colors. This method of decorating Easter eggs is very messy – but lots of fun! Just to be sure to wear an apron and spread lots of newspaper around your work surface to catch the flying paint. 1. 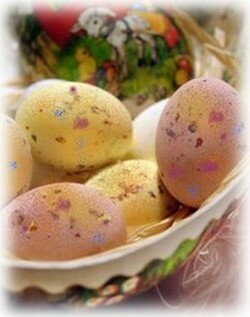 If you want to begin with colored eggs, then dye the eggs using commercial egg dye or natural egg dye. 2. Spread newspaper over your work surface. It’s also a good idea to protect the front of your clothes with an apron or smock. 3. Dip the toothbrush in a small amount of paint or dye in a contrasting color. 4. Run your finger or thumb over the top of the toothbrush bristles to splatter the eggs with small drops of color. You can wash the toothbrush and use a second or third color to make speckled eggs with lots of different colors.